How much space is left now that you have it set up? I have almost 49GB free... Not much on it yet though. About 25 apps, no music and my photos are moved to Google Drive then deleted from the phone..
SteveISU and DMP89145 like this. Here's mine. Plenty of room left for me. I've used 20.9GB. I live where WiFi and data is abundant. So I have no need to keep a lot of things on device. I'm about the same as the others... Actually, this is "fat" for me... Probably need to edit. I have some music as well as audiobooks loaded. on the p2xl, iPhone x, and iPhone xs max, i Went with 64gb. The 2 oldest phones, the p2xl, and the x, did not get above 30% after extended use...Weeks and weeks. I sTore everything online, be it G drive, onedrive, or other. , And generally do not keep unused apps around. Anything more than 64 seemed like a waste. Got like 44 gb free. I have unlimited data and WiFi at home. I have subscriptions to Google Play Music and Spotify, so I don't store music. Or videos. 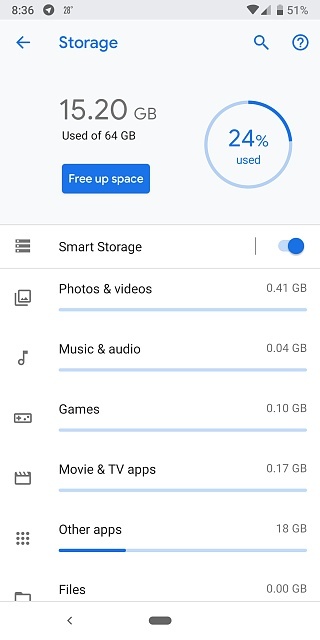 Photos are backed up to Google Photos. 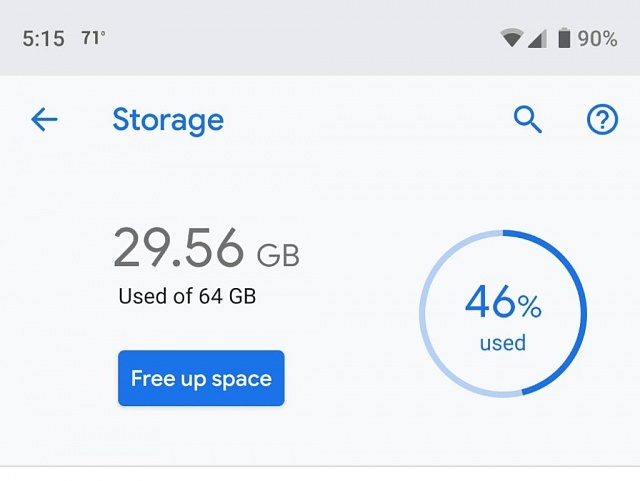 I have a 128gb pixel 2 and have only used like 33%. I'm thinking now that I could have saved some money and gotten a 64gb one. What was your usage on your past phone? Similar to others, I still have about half of my space free. Just upgraded from the original Pixel - I sprung for the 128 MB version of that one but it never got to more than a quarter full. I will have plenty of space. I've had my 2xl for a year and I'm at 38% used. Same as others. Google photos, streaming with google play music and not a lot of apps. 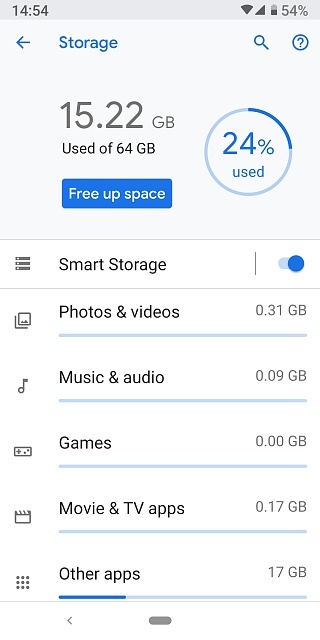 For my usage, I just don't need that much storage. 64 is plenty for me. I use the clouds a lot for google photos, music, and movie. i used up 40 GB right now, but that's because i have 12 GB of audio book on my phone. most of that will be gone soon once i get around backing them up on my home harddrive. My previous 2 phones had 16 & 32 GB. I had to manage the 16, but the 32 GB one I had used about 20 to 22 GB. Didn't have any music on them and used Google photos for cloud storage of pics and videos which helped keep things easier to manage. But now I'm keeping some music and podcasts on my phone and haven't found that I'm using as much as I thought I would. I went w/ 128 GB on my Pixel 2 XL and I used maybe .. 40-50% at a time.. and that is with me loading up a bunch of media. TBH 64 GB would be fine for my uses even with storing some media. Ya know when we buy a 64 gb phone, that shouldn't include the operating system. They should have a bigger storage just for the operating system just to be fair. That isn't how computers / hard drives have ever worked. You get the capacity, formatting causes some loss of space, and then of course you need a OS. The hard drive manufacturer sells the hard drive at its capacity... obviously the OS is going to take some space. I'm well aware if that. I was making a statement if how it should be. Yeah sadly that'll never happen since they can't direct quote it especially due to updates and whatnot. Changing what the box says constantly isn't realistic for manufacturing. I don't have mine fully set up with apps, but right now I have 47GB free with maybe 6-7 more apps to install. I use Google Photos for pics and that's a chunk. Music took about 1.5GB. Kids games could take another 10GB. I feel I'm in pretty good shape. I bought 128 because I could afford it. My current Pixel only has 24Gb's used and I've had it for two years. I don't have any music or videos on it and don't really commute to work ( I drive a short distance). The base model should have 6gb's & 128gb's of storage. This is late 2018 & I expected better specs. Plus the notch is a no go for me. And raising the price 150.00 dollars is definitely a considerable hike! What am I doing wrong with do not disturb? Help with cricket phone selection for 15 yr old.